When it comes to having fun, few things are more exciting to children than trampolines. They give kids superhuman abilities, letting them to fly through the air like their favorite superheros and enabling them to perform feats of athleticism like their favorite sports stars. Additionally, trampolines are a great way for children to stay active. They help children learn how to coordinate their body, improve their balance, agility, and stamina, and increase their spatial awareness. For some, the idea of a trampoline brings to mind fears of broken bones, sprained ankles, and other injuries. But the fact of the matter is that trampolines are quite safe — especially when compared to team sports like tackle football, where head injuries can lead to serious lifelong trauma. When it comes to the best trampoline options for toddlers and young children, there are many products available. Most are pretty good, but there are a few that really stand out. We’re going to highlight a few that really appeal to us, and discuss further some common questions and concerns that people have when deciding whether or not to buy a trampoline for their kids. With a safety weight rating of 100 pounds, this is one of the best trampolines for kids, toddlers, kindergartners, and even elementary school aged children. It was designed and built with safety being the main priority. Its padded polyethylene safety net ensures that nothing and no one will fall out, while the galvanized and powder coated steel base legs provide stability so the unit won’t shake or tip over. It is low enough to the ground so children can climb in and out at their leisure, with a large, easy to use zipper that opens and closes the safety net access point. The trampoline was built to withstand the elements, but at a height of 79”, it is small enough to fit in basements, playrooms, and other indoor spaces. It is seven feet in diameter, large enough to facilitate multiple jumpers. And even though it is rated at 100 pounds, you can still jump in there with your kids without having to worry about it ripping or breaking apart (just be careful not to hurt yourself as the jumping mat will likely bottom out under heavier weights). The Bazoongi 48-Inch Bouncer Trampoline is the perfect option for your little one to get their energy out and bounce the day away. Unlike the previous trampoline, this one is built for single-person use, which might be problematic if you have multiple children who haven’t learned the art of sharing yet. Theoretically, it can facilitate multiple jumpers because it is rated up to 100 pounds, but the 48” diameter might be a little constricting. It comes with a padded, removable, and adjustable handle to aid the jumper’s balance and provide stability. Speaking about stability, the mini trampoline has six legs around its circumference, so it won’t tilt or flip when bounced on. In terms of assembly, the unit is relatively simple to put together. We would suggest, however, that you attach the springs in order of opposite pairs — starting at the top, then the bottom, then the left, right, etc. As the least expensive option that we’ve looked at so far, the 3’ trampoline by Little Tikes is the perfect trampoline for toddlers to burn off energy. It’s not as heavy duty as the previous trampolines, and incorporates more plastic into the design to lower costs. Like the Bazoongi, it comes with a handlebar to help with balance. Unlike the Bazoongi, however, the handlebar is not adjustable, and is fixed 26.25 inches above the jumping surface. Where the aforementioned trampolines could be used by a wide age range of kids and even teenagers, the Little Tikes trampoline probably cannon. It is specifically designed for children aged between three and six years old and under 55 pounds. It is also designed for indoor use only, and not made to withstand the elements. Because it is so light, however (at a little over 14 pounds), it can be easily carried from place to place. It doesn’t use metal springs, but instead lightweight elastic webbing. A nice blend between a small indoor exercise tramp and a large outdoor trampoline, Skywalker’s Seaside Adventure trampoline is large enough to catch some good air, yet small enough to fit indoors. It’s complete 360 padded handlebar helps uses to stabilize themselves as they jump, using stretch bands in lieu of springs to provide the bounce. It has both a safety net for the jumping area as well as a lower enclosure that keeps children and objects from going underneath the unit and getting stuck or jumped on. It is certified to hold up to 100 pounds, stands roughly 15” above the ground, and has a 60” diameter (with a jumping surface just north of 14 square feet). Will I put it inside or outside? How much space does my home have? Do I need a big trampoline, or will a small one do? How much can I afford to spend on a trampoline? 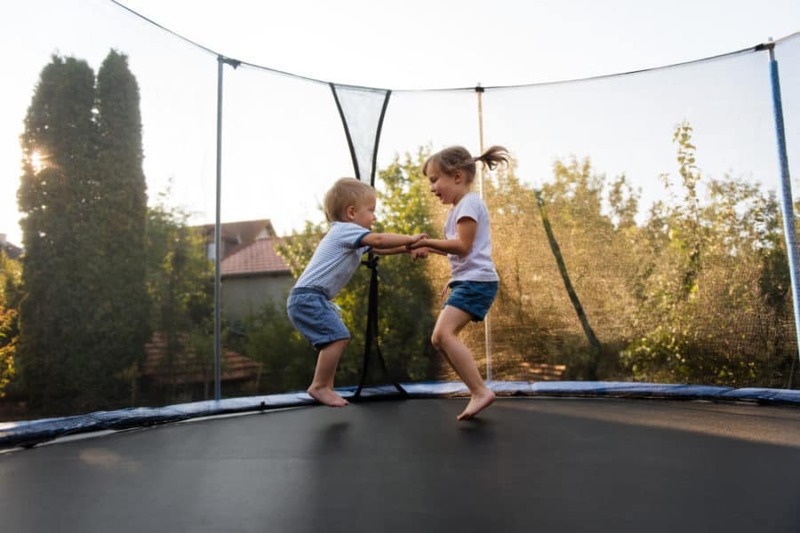 In this section, we’ll help answer some of these questions and shine a little light on what makes a good trampoline for toddlers and pre-teens. What Are Some Common Materials Used In Kids Trampoline? The best materials used to make trampolines are usually more expensive than their underperforming counterparts. And where durability, functionality, and versatility are concerned, sometimes the extra cost for better materials isn’t worth it — especially in childrens trampolines. The materials used in heavy-duty, commercial grade trampolines are unnecessary for such lightweight and low-impact users. In many of the indoor trampoline models, some or all of the steel components are replaced with plastic. High-Density Polyethylene is a strong thermoplastic that is often used because it performs as well, or even better in some aspects, than metal parts. Because the trampoline is designed to be used indoors, the parts don’t require powder coating, galvanizing, or UV protection. They won’t get rained on so they’re not made to be waterproof, and they don’t have to be as durable because they won’t face strong winds, hale, or any other weather-related event. Polyvinyl Chloride (or PVC) is a common plastic material used in both indoor and outdoor trampolines… and pretty common in other products as well. You may have heard of PVC pipes, which are used as plumbing tubes and electric conduits. This is a strong and safe plastic that is non-toxic and child-safe. It is structurally sound, so frame components, upright safety net bars, and even the legs and base of some trampolines are made from PVC. Polyethylene (PE) is a common material found in the padding of childrens trampolines — both around the safety net poles and on top of the springs/elastic bands. Regarding the latter, the PE is typically encased in a vinyl cover with sewn-in straps and fasteners. The jumping fabric can made from waterproof canvas or woven fibers like nylon and polypropylene. Because of its cost benefits, polypropylene is the most commonly used. Many parents have safety concerns when they are considering a trampoline for their children. There are many stories about kids who injured themselves on trampolines, but most of these incidents occurred on larger, backyard trampolines, many of which lacked safety nets. The smaller indoor trampolines are much safer. But even the mid-sized ones aren’t that dangerous (so long as you have a safety net). At that age, children are often too light and lack the strength needed to bounce high enough to incur a serious injury. Further, as they are just developing their skills, they won’t be attempting complex aerial movements that put them in dangerous positions. Trampolines definitely aren’t perfectly safe, but neither is life. There are constant risks that we all must face, and the best we can do is mitigate these risks. And while the potential for sprains, fractures, and neck injuries do exist, unless you raise your child in a bubble, there are going to encounter similar risks every single day of their lives. With over sixty years in the business, Jumpking trampolines — creator of the Bazoongi — is the largest trampoline manufacturer in the world. In 2004, Jumpking was bought out by the YJ Corporation, and have sense expanded their product line to include bounce houses, play cottages, and kids’ slumber bags. Skywalker Trampolines is a member-company of Skywalker Holdings, a firm that was founded in 2004 and based in Bringham City, Utah. The company manufactures and distributes a wide variety of trampolines, games and accessories, including mini trampolines for toddlers and enclosed backyard trampolines. Trusted, safe, durable and innovative, Skywalker operates under the philosophy that equipment for children should be fun and safe, an engaging way to enjoy the outdoors. based in Ohio, Little Tikes makes baby toys, preschool toys, and a score of activity toys — including wagons, scooters, play houses and, of course, trampolines. With every product, they try to encourage active and imaginative play, as every day is an adventure with endless discoveries to be made. Creating wonder and letting kids dream big is what they’re all about. And with over 48 years of experience, they strive to achieve their mission through continuous and sustainable improvements in teamwork, innovation, and customer satisfaction. Q: How safe are mini trampolines? A: Compared to their larger backyard siblings, indoor mini trampolines are much more safe. First of all, they don’t provide as much bounce, so the jumper can’t reach the same heights. If the users don’t get as high, they don’t come down with as much force, making serious injuries less common. Additionally, mini trampolines are space prohibitive, allowing only one or two users at a time. With larger backyard trampolines, there is plenty of space, so it’s hard to convince and force children to bounce one at a time. Q: What are the benefits of trampolines for kids in terms of exercise and bodily development? A: Properly using and being active on a trampoline can benefit your child in many ways. To start, it is a great cardiovascular exercise, which builds and strengthens the user’s lungs, heart, and respiratory system. Bouncing on trampolines can also help your child develop balance and coordination, building synaptic pathways in the brain that will help them in a variety of everyday physical tasks. The benefits, however, aren’t strictly physical. Studies show that when children, or anyone else for that matter, performs acts of physical exertion, their brains flood with neurotransmitters and other helpful chemicals that facilitate learning, retention, and creativity. While these benefits come from exercising in general, trampolines make it fun for children to stay active, keeping them coming back day after day. Q: Are there other alternatives to trampolines? A: There are several products on the market that are similar to trampolines in that you can bounce on them, but different in their construction and use. Bounce houses are like trampolines, but use air instead of springs or elastic bands to provide cushion. They also provide much more than trampolines, which are basically just a flat jumping surface. Bounce houses can including slides, tunnels, and even pools. Commonly designed as medieval castles, multi-level magical fortresses, and even boxing rings, fire trucks and helicopters bounce houses allow your young ones to let their imaginations run wild. Some include climbing walls, which are fun to ascend, while others have ball pits or watery slip and slides. The main caveats with bounce houses are that they require a lot of room and are a good deal more expensive than trampolines (especially indoor trampolines). Trampolines have gotten a bad rap. But for all the dangers they present, there are also benefits that they bring that shouldn’t be overlooked. When it comes to children under six years of age, using a large, outdoor trampoline presents risks that, in our opinion, are unjustifiable. Not only that, but larger trampolines are simply unnecessary for young kids, who can receive the same benefits from a smaller, indoor trampoline that presents less risk and costs less as well. Among the myriad options for small-size indoor trampolines for kits, the Bazoongi 48″ Bouncer Trampoline tops our list for best trampolines for children. It is affordable, adjustable, and the perfect option for children. Its padded balance handle helps users progress at their own pace and safely build up their skills. It is low enough to the ground to stop kids from crawling underneath while in use, and small enough to be easily moved and stowed in a closet or storage space. Give your kids the health benefits of a trampoline while ensuring their safety and wellbeing. Let them work out their extra energy, it’s fun for them, and even better for you! Find more backyard game ideas here.